Curiosidade, qual o valor real dos items de PokeMart? Holas! Anos atrás eu vi uma matéria escrito (Dinheiro no mundo pokemon) daew li um guia/ materia falando de conversao do dinheiro usado nos jogos/ mundo de pokemon... com o que realmente é usado (em dollars) do mundo real, equiparando qual o preco de itens do mundo pokemon e etc e etc. Dai que eu encontrei. Veja. Primeiro. O link acima é o post original em english. In fact, according to Bulbapedia, the ‘Poke dollar’ symbol was specifically created for the English translations of the games, and the original Japanese versions use the yen symbol. Now, for perspective, although the exact exchange rate naturally varies, a US dollar is equivalent to about 120 Japanese yen. So, 200 yen is about $1.67. A Pokeball in the Pokemon games actually cost less then two bucks. There’s a REASON we see so many young kids training Pokemon, especially early in the games. The cost of investing into a Pokeball to try catching their own Pokemon easily falls into the range of a typical kid’s allowance. 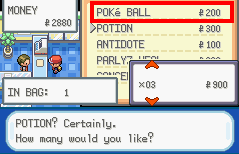 A Potion for healing after battles is 300 (or about $2.50), but since Pokemon Centers offer their healing services for free, that’s a moot point. Youngsters in the early game only give within a range from 50-150 of the currency, which is about equivalent to $0.40-$1.25. The first Gym Leader in Hoenn Region, Roxanne, give 1,680 in Omega Ruby/Alpha Sapphire, equivalent to about $14. Which is about right for the equivalent of a middle or high school honors student. A later Gym Leader, Winona, gives 4,200, or about $35. The Champion, Steven, gives 11600, or $96.67. The winnings from enemy Trainers varies, but Ace Trainers seem to give out about 1500 or $14 on average, give or take. Swimmers (especially common later in ORAS), award a range from 400-800, or $3.33-$6.67. Vitamins (such as Calcium, Iron, and HP UP), cost 9,800 or $81.67 each. An Ultra Ball cost 1,200, or $10. A Paralyze Heal costs the same as a Pokeball, while an Awakening is half that. A Revive is 1,500, or $12.50. What’s the point of doing this? Well, for one, to get a better sense of the in-game economics, which can be hard to grasp if one doesn’t realize the in-game ‘Poke dollars’ are based on the Japanese yen. And a look at said economics reveals some interesting details. First, it shows basic Pokemon training and raising is well within the affordability of a ten-year old, or older. Which makes sense as Pokemon is aimed at younger kids, and the develops would want them to have the sense that going on a Pokemon journey is something they could do if they somehow ended up in the Pokemon world. On the other hand, it also shows there’s really not that much money to be made in Pokemon raising and traning, unless you battle frequently and regularly against higher-level opponents regularly and and win. Which is…very much in line with how professional sports work in real-life. Pokemon battling gets compared to a sporting event a lot for a reason. The initial 3-D games were even called Pokemon *Stadium. * Parallels are frequently drawn between the Pokemon League tournaments and the Olympics in the anime. The low money output is probably also why we often see Gym Leaders and the like working other jobs. Just something interesting I decided to look into. I’m a Pokemon fan first, before any other fandom, and always will be. It’s shocking that I haven’t written any meta on it yet. The 1000000 price for the bicycle translates to $8259.51, which is the price of a top quality bike for proffesionals. Excellent catch! Helps explain why the bikes can ride through stuff like snow and sand. They are of excellent make. And it also helps explain why the bike shop owners are happy to give out their bikes to a prospective Pokemon Trainer for free (whether through a voucher or otherwise). Your average Trainer taking the Gym challenge puts those bikes through the *wringer. * Riding them along mountains, through marshes, and even through snow. But a bike being able to endure that is the kind of thing a professional rider would look for, and desire. Most Pokemon Trainers will never be able to afford the bikes, but are in one of the best positions to push them to their limits. So giving them out for free is actually a clever marketing move. Imagine a potential buyer seeing a Trainer riding one of those bikes in Lillycove, and said Trainer reveals they rode it from Rustboro (which means they rose it around a mountain, several caves, a few marshes, and possibly other environments I’m not thinking of right now). That’s a hell of an impression to make, and a fast, easy way to sell the buyer on getting the bike themselves, especially if they ride competitively. Case in point, in Pokemon Gold/Silver and their re-makes, the bike shop even gives you the bike specifically as ‘advertising.’ After you’ve ridden it around long enough, you get a call saying that because of you doing so, their sales have shot through the roof (and happily tell you to keep the bike). And it’s no wonder why. Never underestimate the amount of money people are willing to pay for fancy water. Frase pessoal : ~"You are my lucky charm"
Re: Curiosidade, qual o valor real dos items de PokeMart? Dá pra perceber que os itens não seriam > tão < caros, exceto pela bicicleta. Uma análise e comparação bem legal. É engraçado ver que Pokébolas seriam muito baratas, mesmo sendo responsáveis por capturar e armazenar criaturas enormes como Wailord e Rayquaza - mesmo Ultra Balls, custando em torno dos 10 dólares, continuam não sendo caras. » Qual o melhor protagonista de Assassin's Creed? » Que Equipas ou Equipa vais querer treinar no FM15?Qual o teu 1ºSave?E que tipo de Treinador vais ser,Tracksuit or Tactical?